Professional control for modern production. 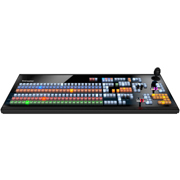 With TriCaster TC1, you have your choice of companion control panels to suit your workflow, environment, and budget. The TriCaster TC1LP and TC1SP control panels are expertly engineered to combine the comprehensive functionality, precision controls, premium hardware mechanics, and ergonomic design that operators need, with modern styling that appeals to clients and executives.